The shoulder's large range of motion and shallow socket in part make it and surrounding soft tissue susceptible to injuries. 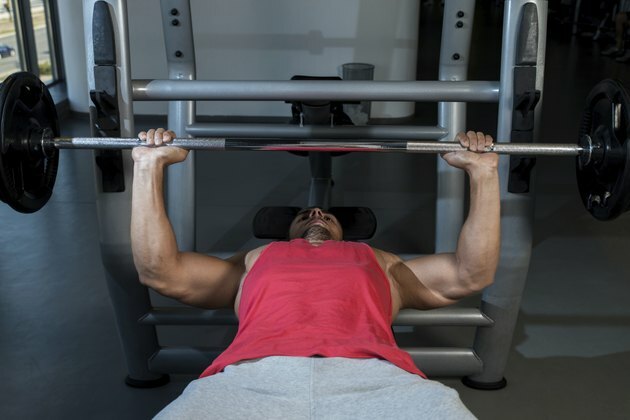 Improper bench press technique, lifting weight that is too heavy and overtraining can further increase your risk of injury. Common shoulder injuries include a glenoid labrum tear, torn rotator cuff muscle and shoulder impingement syndrome, which is when tendons around the shoulder are pinched and inflamed. Physical therapy is a conservative treatment plan but can also be performed following surgery, which is often necessary in severe shoulder injuries. Consult you physician about physical therapy and other treatment options. Rest, ice the area and take anti-inflammatory drugs during phase 1 to reduce inflammation and pain and to allow your injury to heal. Range-of-motion exercises include codman's pendulum swings, triceps stretch, chest stretch and horizontal adduction stretch. For example, the codman's pendulum swings are performed leaning on a table and your unaffected arm. With your injured arm hanging straight down, swing it in circles, forward and back and side to side, repeating each direction 30 times. Perform stretches two to three times a day, holding each for approximately five seconds and repeating up to 10 times. After you regain pain-free range of motion, which is usually within one to 10 days, you may progress to phase 2. During phase 2, perform shoulder strength exercises while managing any residual pain and inflammation. Apply heat for 15 to 20 minutes before exercises to warm up muscles, and apply ice afterward to prevent additional inflammation. Strength exercises include shoulder flexion, extension, abduction and internal and external rotation. A supine press may also be performed, which mimics the movement of a bench press but with light or no resistance. Other exercises include shrugs, bent-over rows and bicep curls. Slowly increase resistance using therapy bands or light dumbbells. Three times a week, perform three sets of 10 to 20 repetitions. Progress to phase 3 after you regain normal strength, which may take between two and five weeks. Phase 3 prepares you for daily activities and return to sports, and reduces your risk of re-injury. Weightlifters, for example, may start to return to normal lifts such as bench press, but at a lighter weight and reduced frequency. Continue to apply heat and ice as necessary to manage pain and inflammation. Exercises and stretches from phases 1 and 2 may be integrated into your phase 3 exercises to ensure complete recovery. Your physical therapist may monitor phase 3 closely or simply provide guidelines for return to normal activities, depending on the severity of your injury and if you are returning to sports. Physical therapy post-surgery can take up to 20 weeks and has some additional guidelines. During phase 1, immobilize your shoulder in a sling and keep your incisions clean. Phase 2 goals are to regain shoulder flexibility and stability, and phase 3 includes strength and functional exercises. Your progress and return to normal activities may be further monitored in a fourth phase.